Non-spill spout from Williams Sonoma. 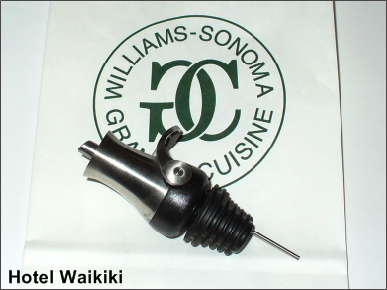 I bought this kitchen gadget from Williams Sonoma at Ala Moana Shopping Center next to the Nordstrom store. Perhaps in another life it was on a gin bottle. I'm getting tired of having to grasp an oil slicked Wesson oil bottle. Those of you who cook at home might relate to this. Every time you pour cooking oil into a frying pan inevitably some oil drips onto the side of the Wesson bottle leaving the bottle with a sticky residue. This spout is suppose to spare me the hassle. It's always a pleasure shopping at Williams Sonoma no matter what you buy there. Whereas, last week I was at Home Depot when a little girl came up to me in the parking lot and asked if I wanted to buy some cookies for a church fun raiser. Of course, I told her that I already gave, bought it a few minutes earlier. "Oh, that was my sister." I'm okay with that. Her sister then appears outta nowhere and pitches me with the sale. You realize I was just making the excuse up, don't you, and whadda I do now. But then the first sister says to the second sister, "Don't you remember, you just sold him cookies." Just the other day, same Home Depot parking lot, this middle age woman asks me for money so she can buy herself something to eat. What is it with this particular Home Depot parking lot? In other news, my bank left me a voicemail notifying me that one of the merchants I shopped at, the merchant's data bank was breached, and the usual, our names, birthmarks, card numbers, etc. stolen. So they've already went ahead and canceled my bank card and I should be receiving a new card in five business days. I'm not a bigger spender to begin with. I still have a roll of paper towel that I bought at the start of the year that's only half way, still half a roll left. Williams Sonoma is the best. They don't advertise it unless you're doing a wedding registry there - but they guarantee every product for life. If the blender you bought there five years ago dies, bring it back to WS. They'll give you a new one if it's still being made or give you a store credit equal to the amount you originally paid for a replacement. They make this amazing non-aerosol oil mister. You put whatever kind oil you want in there (flavor it yourself etc), pump it a few times, and it mists just like those aerosol ones. Chad can't use it enough. Love love love it! HILARIOUS!!! How come nobody ever approaches me at Home Depot? I must look poor. Ann- it's always a nice experience just walking into Williams Sonoma. "....They make this amazing non-aerosol oil mister. You put whatever kind oil you want in there (flavor it yourself etc)...."
"oil mister"? We're only talking about cooking here, aren't we, LOL? gigi- it's only been lately. I guess the entrepreneurs figure they can work you while you're in a spending mood, in their minds. Fancy device. I'm surprised you still have half a roll of paper towels with a oily bottle like that. Does the device work well? Nate- a fishing lure for the Ala Wai, why not? Fresh fish. Crab. Car tires. Etc. Kahuku- I try to make things last. Waste nought .... want nought. About does it work. I'll have to find a bottle with a diameter that fits the spout. I like the idea of that non-spill spout. Is there a seal at the top or is it always open then? Does it work well? That sounds really good since I've always got oily bottles. Kay- the top of the spout has a raised lip encircling it, so any spillage pools into the lipped area and drains back into the bottle through a puka instead of dripping down the sides of the bottle. Is it worth the $10 that I paid for it? We'll have to see. Definitely material for a future post, LOL. Cloudia- not too much dollars growing on the money tree, lately. Btw, I worked on the finish phase of Nordstrom.